Yes, my sister Linda/Xinda painted the walls of my apartment orange (at least in the living room). She even put some orange drapes up early on, but later decided to take them down. I might just have to post some pics once this storyline’s done, showing the extent of what she has wrought on the interior of my apartment. Ha that’s the color orange i picked to paint my bathroom. the paint my sister used in my apartment has a bit more red in it than the stuff in the strip, Jason, but i didn’t want it to look like blood. heheh. hope your bathroom looks cool! sounds like they’re a perfect fit, then, Jason! evil sisters are so sensitive, Eddie! We should all be grateful that Xinda decided to show her displeasure with paint alone. Especially ‘bot. No kidding. She could have easily shown her displeasure with a knife, or a bat…. or a spoon. yes, a “pain” treatment would be very bad, Eddie. and… ugh. i can only imagine the pain she’d inflict with a spoon, Fijiman. Too true. Especially when you consider that knives are designed to cut things, whereas a spoon is not designed to do so in any way, shape, or form. yes, it’s a good thing she wasn’t holding a paint trowel or something sharper when bot went in there, Maddgodd81! Orange you glad it wasn’t purple? Sorry. I could not resist. Yeah, that’s pretty much what my sister would do too. I love that she was so carried away that she kept right on painting! You’ve gotta give her credit, she’s a force! i know i shouldn’t encourage you but i’m glad you couldn’t resist, Funnyshaffer. heheh. throughout my years, i don’t think i’ve ever had my walls any color besides white, ZAD-Man, so my colorful apartment interior is quite a change! (For the record, I picked out the colors for my bedroom myself when we re-did the walls and floors a year or so ago. Emerald-green on two walls, pale-green on the other two, and white ceiling. Very nice. So basically, you sleep in an emerald room? Couldn’t help but crack up a little, I’ve heard of red in the face but this is just silly. And hey, if you anchor down the orange with some earthy tones or warm colors it can look extremely classy. very true, CE. also, my face wouldn’t look good in black and blue. purple and silver would be hard words to rhyme with, too, 11TN. hopefully, Xinda has no plans for those colors in bot’s apartment. I’m guessing this is a point where the phrase “I have not yet begun to paint!” would come in handy? aww, that sounds like such a cute color of paint! I assume there are more evil things to come yes? there’s nothing left to paint, Xin – i think you’ve got everything covered! (but thanks for the details, in case any readers out there want to paint their own places “koi.”) 🙂 you aren’t thinking about painting the bathroom, are you? NOT poo brown! Oh a loverly robin’s egg blue or something…Maybe a seafoam green? Of course my FIRST thought was pink but then I remember JB is no a girlie! Real men are not afraid of the color pink. It’s my second favorite color, after forest green. This is really weird, my dad and I are getting ready to paint my room RIGHT NOW. Unless you were just taking a break from painting, yes you should. so what color are you guys painting your room? We painted the bedroom in our old place something called terra cotta — we were frightened when we opened the can (okay, only one of us was frightened, the other one was stoked), but once it dried, it was gorgeous. In our old house, I painted my tiny office this dark, peacock blue. Everyone told me it would be cave-like, but it wasn’t — it was like writing by the ocean. Don’t look a gift redecorating in the mouth, I guess. Orange would definitely NOT be my first choice of colors – or second, or third, or tenth. But I lived in a rental house with an orange living room and it wasn’t as bad as I would have thought. So in real life, will you have to re-paint before you move out? yeah – Linda just had this whole koi/french blue color scheme in her head, shanna. i kinda debated with her about it at first, but then i just had to trust she knew what she was doing. was scary. heheh. and, yep: must repaint when i move out. my sister says she’ll help, but she lies sometimes. I think just about anyone would sob if they saw that. That or they would lash out in a fit of rage. At least it’s not brown. My Bestfriends soooooon to be ex husband (not soon enough!) painted the guest bathroom brown…because his sister’s entire house is that color so it must be a good color. And not only brown but poo brown. HIDEOUS! Oh and the living room is pink….Now…while that isn’t a bad thing….I love pink. But it’s the color of pepto bismol! Orange is definately not my favorite color. wow. i love the color brown (i think it’s actually my dad’s favorite color) but i don’t think i could deal with my living room that color, Pixie. a cool brown, maybe, but definitely not poo brown. at least it didn’t stink like poo, right? Orange can be a really good color: warm and inviting, but sunnier than red. But probably not for more than an accent wall. Hopefully she didn’t do your entire room orange! heh. yeah, i think a completely orange room would’ve driven me insane, Sharra! (and sometimes i feel like i’m teetering on the edge of sanity as it is.) in Real Life, she painted two walls in the living room orange (plus my headboard) and two walls in my bedroom dark blue. I hate citrus fruits so that color would mess with me. Never interfere between the artist and its work. Especially if the artist is your maniac killer sister of doom . Good luck JB! On another note…how strict is your rental agreement? it’s true, nicobot: jefbot should’a known better. heheh. Actualy, depending on shade orange can be quite nice as wallpaint.My Mom painted part of my parents bedroom with orange… and other 3 collors too, all leftovers from painting other walls. It meshes surprisingly well together. And Jefbot should have known better than to leave Xinda unsupervised. Not that it would help any, but still. Painted Bot? Thats an artists hand I tell ya! you’re right, Maryz – orange in a room is a way better color than i would’ve thought. and this “koi” orange (it has a little more red in it) my sister got for the BOTcave is very cool, especially in sunlight. yeah, it was kind of an inevitable outcome; bot should’ve known to have his guard up before he went charging in there. at least Xinda left his Dr. Pepper unmarred. It looks like now that bot’s joined the Schuetze ranks of getting banned from places, Xinda wants to get in on a brother-sister banning. Aww, gotta love those touching family moments, especially the kind you can celebrate with M-80s in the rent drop slot. red huh? Funny my office is painted red and gray. actually looks pretty good. red and gray sounds pretty cool, steve; i was kinda angling for lime green and gray here, but suffice to say, it didn’t happen. We do not appreciate spammers here. Post a real comment or go look up another web comic that IS about space aliens. thanks, Fijiman. i couldn’t tell if E was a troll or just overly enthusiastic. i decided to believe it was the latter. E might just be overenthusiastic, but to ask for the exact same thing twenty times out of a web comic that isn’t all about that thing, it’s spam. Also, the fact that whoever E really is chose the name everyone to imply that whatever he/she writes is what everyone is wanting to be in no way cute or funny. Do you hear that E? I’m on to you. while i appreciate the enthusiasm, E, i must say: patience. “more space aliens” will come when they’re ready. Who in their right mind would sell her paint?!?! People who don’t like getting stabbed and/or people who don’t know about her. i sometimes wonder whether Linda/Xinda has been banned from any home improvement stores, TCG. she’s done a lot of work on her own home, so chances are she has. i might have to ask the next time i see her. there was a time in the ’80s that i probably would’ve loved neon paint, Jaeh, but yeah: those times have passed, thankfully. – was Xinda’s paint attack a one move swing or a two move combo? 1) so you think i should draw jefbot that way with the orange stripe now, all the time, supersonic cucumber? 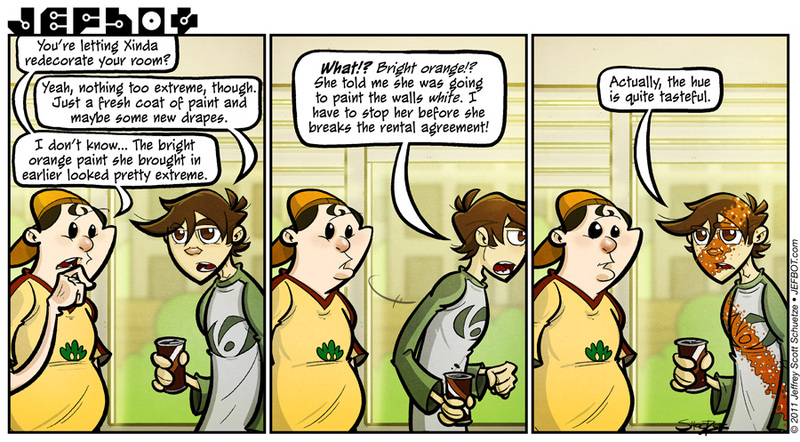 Just realized, in the last panel, jefbot may, in fact, be commenting on the FLAVOR of the paint! Looks like Xinda got him in the mouth with her “Angry Paintbrush of Displeasure” attack. Hope she’s using non-toxic paint.